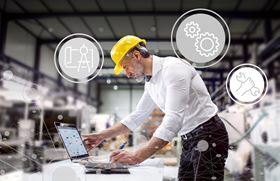 Mitsubishi Electric supports companies to integrate smart manufacturing products into their operations. At the recent SPS IPC Drives exhibition in Nuremberg, Mitsubishi Electric presented its products and technologies for industrial automation in three production areas - engineering, manufacturing and maintenance. Mitsubishi Electric supports companies to integrate smart manufacturing products and one product on show at the exhibition was the life cycle management tool MAPS. Using object-oriented functions, it integrates and visualises both Mitsubishi Electric devices and external equipment. MAPS 4 is designed for connection to the cloud and can be adapted and scaled to a specific project. In terms of manufacturing and intelligent automation, Mitsubishi Electric offers control and drive technology, operating devices, software and circuit breakers as well as robotics. One example of integrated robotics is the company’s new robotics starter package, which consists of a MELFA RH-CH Series SCARA robot, a CR751 controller, teach box and software. Predictive measures are increasingly being used for maintenance and Mitsubishi Electric offers the GOT Drive function. Available on servo drives and frequency inverters it enables commissioning, adjustment and maintenance directly via the graphical user interface of a GOT2000 series HMI. Maintenance support for on-site service is also provided by an IIoT application from Mitsubishi Electric using Augmented Reality. Digital twins can be displayed in virtual space to indicate maintenance requirements and recommendations.